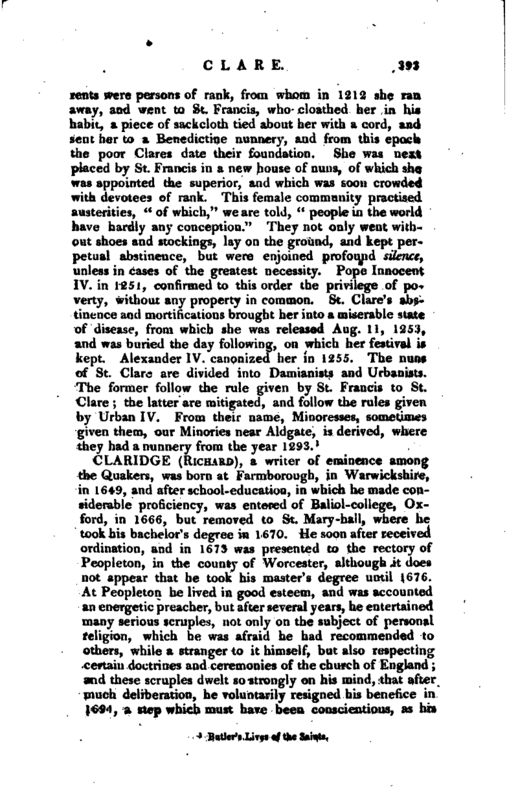 , a writer of eminence among the Quakers, was born at Farmborough, in Warwickshire, in 1649, and after school-education, in which he made considerable proficiency, was entered of Balio-college, Oxford, in 1666, but removed to St. Mary-hall, where he took his bachelor’s degree in 1670. He soon after received ordination, and in 1673 was presented to the rectory of Peopleton, in the county of Worcester, although it does not appear that he took his master’s degree until 1676. 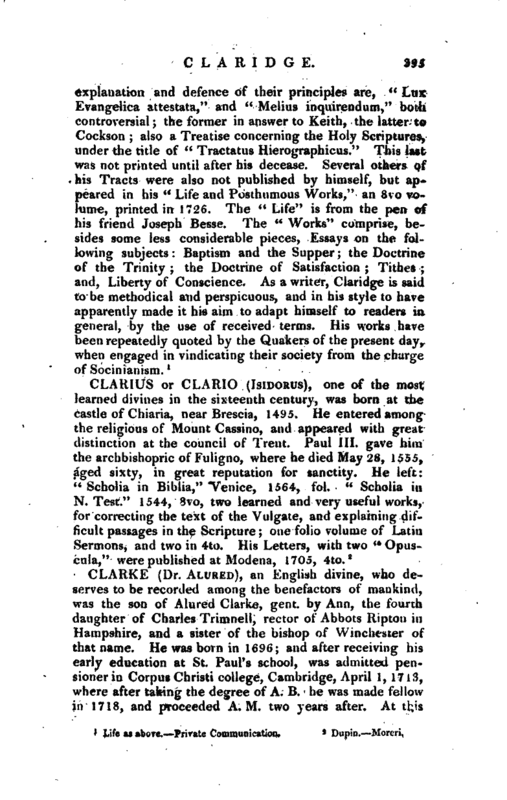 At Peopleton he lived in good esteem, and was accounted an energetic preacher, but after several years, he entertained many serious scruples, not only on the subject of personal religion, which he was afraid he had recommended to others, while a stranger to it himself, but also respecting certain doctrines and ceremonies of the church of England; and these scruples dwelt so strongly on his mind, that after much deliberation, he voluntarily resigned his benefice in 1691, a step which must have been conscientious, as his | living was of considerable emolument, and after quitting it, he does not appear to have possessed any certain income. The same year he joined himself in communion with the Baptists, after submitting to their mode of initiation. An incident on this occasion made a lasting impression on his mind. Immediately after the ceremony of baptism, while his wet clothes were still upon him, a person accosted him thus, “You are welcome, sir, out of one form into another.” But, although this struck him forcibly at the time, it led to no sudden alteration, and he continued for some years in connection with the baptists; till at length his desires after what he conceived to be greater spirituality in religion, induced him to leave their communion; and having adopted the principles of the Quakers, he became one of their society about 1697. 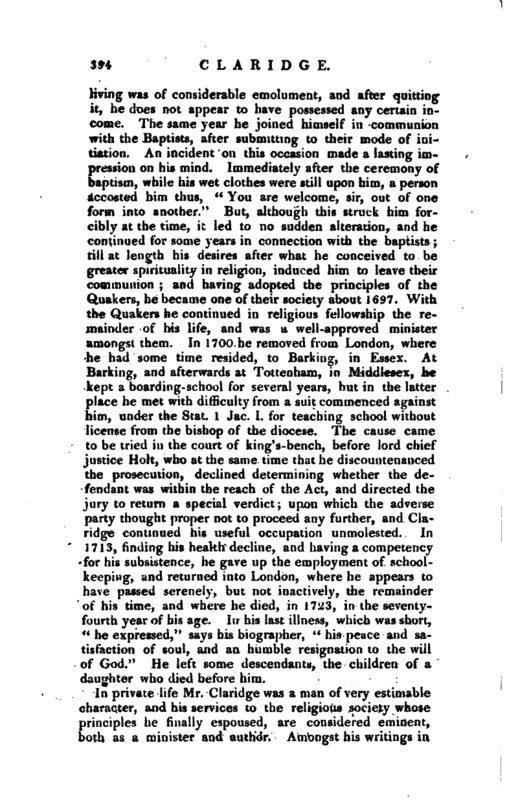 With the Quakers he continued in religious fellowship the remainder of his life, and was a well-approved minister amongst them. In 1700 he removed from London, where he had some time resided, to Barking, in Essex. At Barking, and afterwards at Tottenham, in Middlesex, he kept a boarding-school for several years, but in the latter place he met with difficulty from a suit commenced against him. under the Stat. 1 Jac. 1. for teaching school without license from the bishop of the diocese. The cause came to be tried in the court of king’s-bench, before lord chief justice Holt, who at the same time that he discountenanced the prosecution, declined determining whether the defendant was within the reach of the Act, and directed the jury to return a special verdict; upon which the adverse party thought proper not to proceed any further, and Claridge continued his useful occupation unmolested. In 1713, finding his health decline, and having a competency for his subsistence, he gave up the employment of schoolkeeping, and returned into London, where he appears to have passed serenely, but not inactively, the remainder of his time, and where he died, in 1723, in the seventyfourth year of his age. In his last illness, which was short, “he expressed,” says his biographer, “his peace and satisfaction of soul, and an humble resignation to the will of God.” He left some descendants, the children of a daughter who died before him.